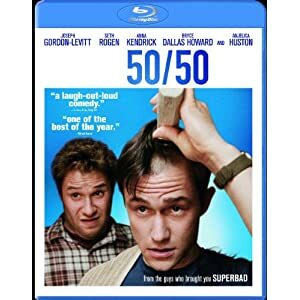 50/50 isn’t interested in defeatism, except as one inevitable way station of the film’s appealing emotional ramble. 105 min. Summit. Director: Jonathan Levine. Cast: Joseph Gordon-Levitt, Seth Rogen, Anna Kendrick, Bryce Dallas Howard, Anjelica Huston. In the last fifteen years or so, cancer memoirs have become de rigeur, in straight prose and even graphic novel format (Brian Fies’ Mom’s Cancer, Harvey Pekar’s Our Cancer Year). Now the movies have gotten into the act by way of 50/50, a cancer comedy for twentysomethings. Of course, the disease is hardly new to the big screen, but it’s rarely been employed in ways that offer comfort or, indeed, respect to those living with cancer; too often it’s the plot device to sideswipe a character and prime a tragic, “weepie” ending. Though the title quotes even odds, writer Will Reiser is himself a cancer survivor; however this semi-autobiographical story may end, it at least comes with the guarantee that it knows whereof it speaks. That’s good news for millions of people touched by cancer who wouldn’t mind seeing an honest reflection of their experience. Reiser lays out a colorful spectrum of emotional reactions, from bitterness to calm to stage-four freakout to love and gratitude for a true-blue support network. Like his creator, twenty-seven-year-old Adam (Joseph Gordon-Levitt) discovers he’s developed a spinal cancer, specifically a neurofibroma sarcoma schwannoma (sorry, though the affliction does become the subject of wordplay, no chorus of “My Schwannoma”). Another cancer, another character sideswiped? Sure, but 50/50 isn’t interested in defeatism, except as one inevitable way station of the film’s appealing emotional ramble. Gordon-Levitt excels here, partly as an amusingly deadpan straight man to Seth Rogen (playing a version of himself as Adam’s best bud Kyle) and Anjelica Huston (lovable as Adam’s demonstrative mother) but more importantly as an Everyman navigating his mortality. Adam begins as an overly cautious individual (while jogging on empty streets, he slavishly obeys “WALK” signals), but as his illusions of order crumble, he allows himself to indulge his emotions and cross behavioral boundaries. His new attitudes partly emerge from the spectacular flameout of his relationship with girlfriend Rachael (Bryce Dallas Howard); pleased-as-punch, Kyle insists that cancer is a sure-fire hook for the ladies, a premise Adam reluctantly tests. Meanwhile, our hero develops complicated feelings for the one woman who’s unattainable, the twenty-four-year-old psychotherapy grad student (Anna Kendrick’s Katherine) assigned to be his counselor. It’s textbook transference, but on the other hand, Katherine is pretty, endearingly earnest, and emotionally accessible, if not—ethically speaking—available. Though real-life friends Reiser and Rogen (also a producer here) have described the project as a hard sell, it’s hard to imagine why: it’s a movie for anyone who’s ever been afraid of death or, y’know, life. They and director Jonathan Levine (The Wackness) may be navigating a minefield, but they never act like it, retracing Reiser’s path freely and mostly nimbly (the film is least credible in its romantic subplot, but with actors like Gordon-Levitt and Kendrick, we’re hard pressed to care). 50/50 proves winningly humane as a carpe diem comedy designed to remind us, gently but not genteely, that what matters most is being true to one another and ourselves. Summit delivers 50/50 to Blu-ray with outstanding A/V credentials and a handful of worthy bonus features. The hi-def transfer offers startling clarity: razor-sharp definition with life-like texture and pinpoint detail. Colors are richly rendered, and contrast well-calibrated. It's a top-notch visual treatment, only wavering in the slightest in occasionally spotty shadow detail, but that's most likely endemic to the source material. While it won't test the limits of your system, the lossless DTS-HD Master Audio 5.1 mix is a definitive audio presentation for this film, with beautifully loud-and-clear dialogue; it also ably captures the immersion heard in theaters (if anything, making it a more intimate surround-soundscape),with ambience subtly setting each scene. Anyone who's ever heard an audio track with Seth Rogen should have a good idea what to expect from the freewheeling audio commentary included here, with Seth Rogen, producers Ben Karlin and Evan Goldberg, writer Will Reiser, and director Jonathan Levine. Rogen keeps the chat boisterous, and the screen-specific track does offer information about specific moments (like the head-shaving scene) as well as general discussion about the story's inspiration, dramatic (and comedic) choices in dealing with the touchy subject matter on screen, and other on and off-topic subjects. Five "Deleted Scenes" (6:17, HD) come with optional Jonathan Levine commentary: "Mom Wants a Third Option," "Lentil Nut Loaf," "Adam Returns to SPR," "Alan Gives Adam His Tie," and "Adam Collapses on the Street." "The Story of 50/50" (7:54, HD) is a brief making-of featurette with Goldberg, Levine, and Rogen on camera to supply the background of the film. "Life Inspires Art" (9:15, HD) segments include "The Bar Scene #1," "The Bar Scene #2," "The Hospital," and "The Office," while "Seek and Destroy" (2:21, HD) gives a glimpse at the filming of the sequence involving the destruction of items associated with an ex-girlfriend. All site content © 2000-2019 Peter Canavese. Page generated at 04/17/2019 09:32:56PM.